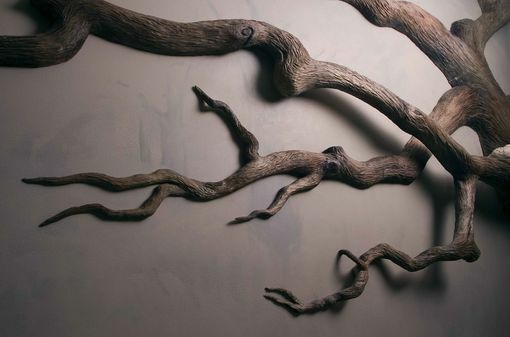 Carved Wall Sculpture - Approached by nature loving clients to "bring the outside in" and the desire to have an oak tree inside their home, I was a little puzzled as to how I would do this task ? 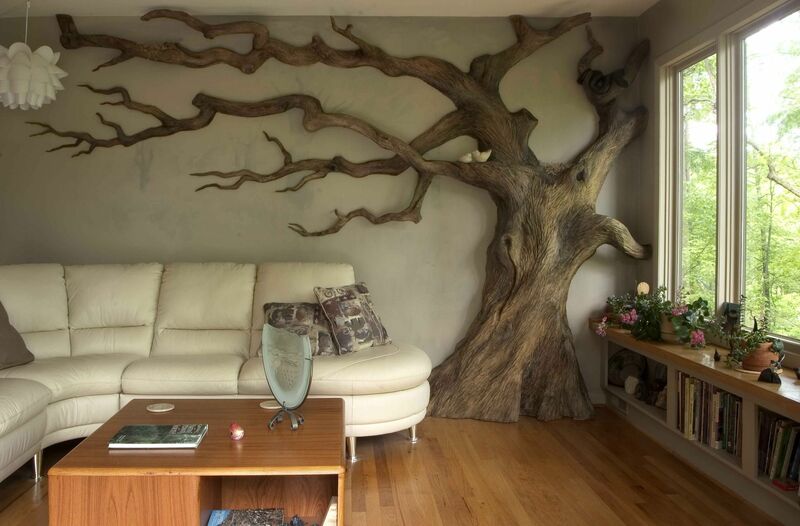 Do I cut down a tree and reconstruct it with-in (hardly the conservancy project) , or maybe collect twigs and bark and make a collage on their wall? So I went to Savannah,GA, took lots of photos of Live Oaks and wanted to hug them all! I had to carve a tree. I made a copy/ mock up wall in my studio with the studs in the exact placement where the artwork would go; 15ft w x 8ft h. I drew the tree right on that wall. Buckeye wood is light in color and weight. A local favorite lumber yard had 4" stock...a lot of it at a great price. It's not the best wood to carve, too fibrous, but it needed to stay rough. Beginning with the trunk, I layered 3/4 levels, adding branches as I went along keeping in mind where they would touch the wall at a stud. When all the joinery and band-saw work was done, the Arbortec carvers, the mini and industrial, were used almost exclusively for carving. The rough surface took the water dyes well. 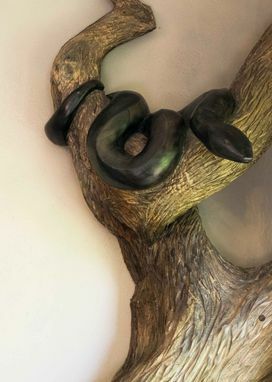 I did one pre-installation , changed a few thing..the snake was facing too far into the corner so I reworked the head angle. Two and a half days for site installation included 2 coats of non-toxic water based finish. 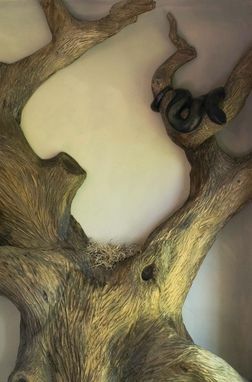 A few days afterward my clients called excitedly and told me the bird-feeder hanging outside the large window no longer attracted birds......the snake was watching at a perfect angle! That was a few years ago. My snake is not harmful and the birds are back.